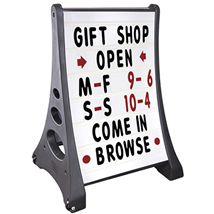 Quick Load rolling A-frame sidewalk sign with changeable message board features 2-sides for advertising. Just Grip-Tip-Roll to move in or out; no lifting or carrying. Has a curved sign face to deflect winds up to 30+ mph. Contains 314 - 4 in. letters, numbers and symbols and 2 sign faces with letter tracks that can display up to 6 lines of copy.